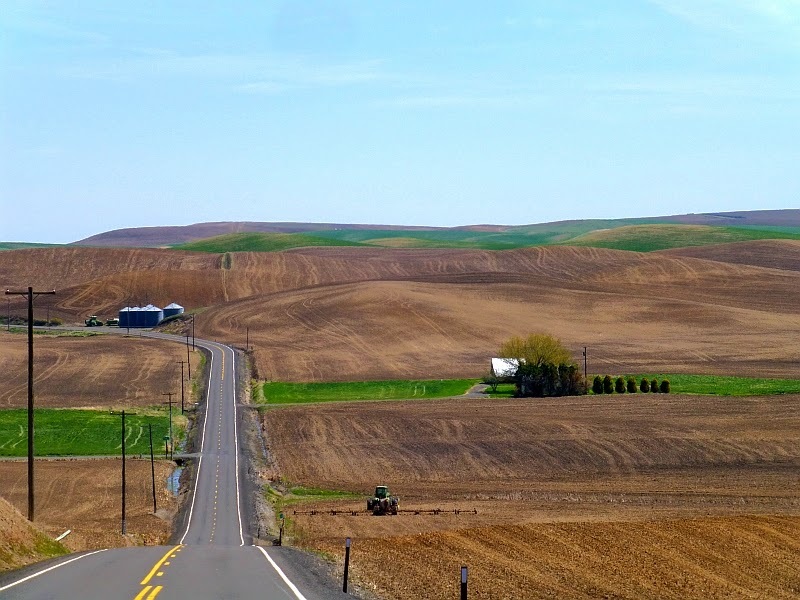 I am writing this from a hotel room in the charming little town of Prosser, Washington. I was asked to be a speaker at a preparedness expo sponsored by the Chamber of Commerce, and it's been a hectic couple of days getting ready and driving here, hence the blog silence. Younger Daughter came with me. 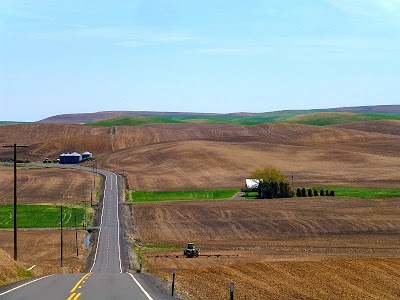 She and I left home yesterday around 10:45 am and drove through the beautiful Palouse contryside, where plowing was actively going on. We thought this pickup, parked on a slope in the middle of a field, was a funny sight. The driver, it turns out, was climbing into a tractor on the other side of the road and not visible in this photo. Why he chose to park in the middle of a field and walk to the tractor on the other side of the road is a question I can't answer. We didn't take many photos of the trip until late afternoon when we got to the Wine & Culinary Center, where the expo is taking place. I was stationed in the Backwoods Home Magazine booth, and we were the first to arrive. We didn't have anything to do that first evening -- I didn't have any booth setup, and Dave and Ilene Duffy of Backwoods Home didn't arrive (we found out) until much later -- so we accepted the invitation by the event coordinators to attend a barbecue at their ranchette, put on for all the vendors and speakers. This morning I arrived at the expo center to find Dave and Ilene Duffy were there and setting up. Even though I've written for Backwoods Home Magazine for many years, I had not yet had the pleasure of meeting Ilene. I was assured by several people that she was one of the nicest people on the planet, and boy were they right. The four of us (the Duffys, myself, and Younger Daughter) had a wonderful time sharing the booth. ...set against a backdrop of a wall-sized cloth mural. Very effective. This gentleman walked by with such a great T-shirt that I asked permission to photograph it. I had one talk in the afternoon (Preparedness 101) that went very well, although it was shorter than I anticipated (it's always hard to gauge how long a talk will actually take). Many people kindly said afterward it was a very useful presentation, which was a relief because I was worried it was too basic. I had the opportunity to meet a number of readers, which is always wonderful. It's still hard to believe that people follow us on this blog, and putting names and faces with readers is a thrill. ...and Younger Daughter was tickled to see a TARDIS (from the TV show Doctor Who) up in a corner. We came back to the hotel room around 8:30 pm, thoroughly wiped but smiling from such an enjoyable day. Tomorrow I give two presentations -- Prepping on a Budget and a repeat of Preparedness 101. And don't worry, I'll make the talks available on the blog at some future point. Yesterday I experienced several 'firsts'. I attended my first Preparedness Expo. As a resident of Prosser, where it is being held, how could I not attend! All of the vendors had nice displays and were very informative, not pushy and took the time to answer questions. I was able to meet & talk to a vendor, setting up a time in the near future to learn more about their product. Then, after following your blog for some time now, I had the opportunity to meet you, visit & have you sign my book! I sat in on you presentation, very well organized, full of information but not overwhelming. I enjoyed questions at the end. I will be back today and I'm looking forward to sitting in your second presentation. Thank you, Patrice, for taking the time to put this all together. The farmer probably parked his truck there because it was were he was probably going to finish up. Note the field on the other side of the truck was not done, it is easier to walk in the morning than at the end of the day.